We wanted to be as transparent as possible when it comes to our products, our methods, and our history and that's why we created this section of Q&A on our Blog. Here we are to answer the most frequent questions people ask us and we are hoping this way you will get to know us better! What does the name Dezen Dezen mean? Dezen comes from the French word "dessin" meaning "pattern" and was commonly used during the expansion of the Ottoman Empire in the Western Balkans. The term survived through the ages and from 1938, Marco's family-run business in Zagreb, used the term Dezen to identify different prints. All the historical prints were passed on from generation to generation and always featured geometrical patterns. In our brand-name, we chose to repeat the word twice, Dezen Dezen, to recall this repetition and geometry of the patterns on the traditional foulard. In our Trieste workshop, we use the same historical dezen on our creations and that's what makes them truly unique. Why did you choose Trieste as a base? both of us love Trieste! We had been visiting Trieste quite often since we were little as it's very close to our hometowns, and before we even started this project Trieste has been a dream location for both. Marco had already been living in Trieste, and Michele just couldn't wait for an excuse to move near the seaside. Trieste might be a small city but it is very well connected. We are close to our families, but also to major cities like Venice, Ljubliana, Vienna, and Zagreb. We were also very lucky to discover the building which now hosts our workshop, right in the historical heart of Trieste, 5 minutes away from the sea and near the Cavana pedestrian street, the perfect place for a quick coffee break. Here in Trieste we also found a welcoming community of like-minded people. Young designers, artisans and creatives have opened their own studios and workshops and it feels amazing to be part of the community. Preserving and developing what once was Marco's old family business is what Dezen Dezen is based on today. They were producing foulards with traditional designs which then were exported in the whole ex-Soviet Block. The company closed down in the 90s. When in 2014 both of us lost our jobs, we decided to work together on a new project. Marco had been talking a long time about the old family business and how he would like to experiment with the old paterns on something new, like a T-shirt. 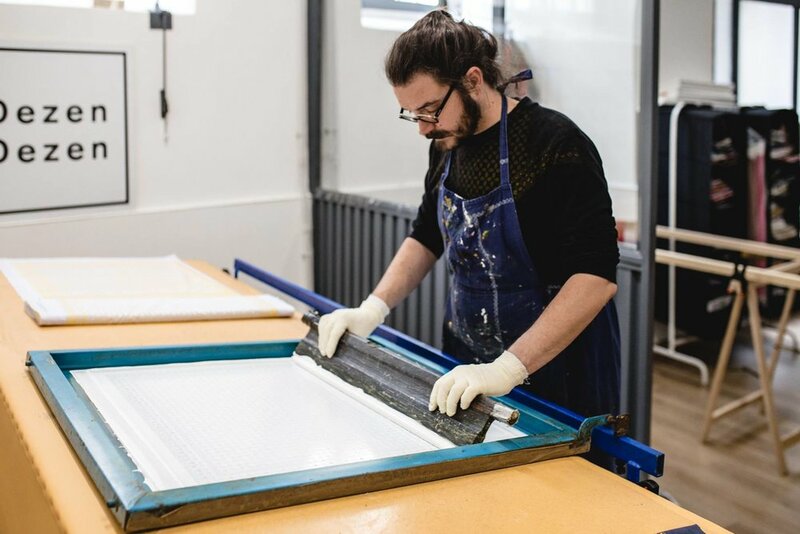 When we visited the family workshop in Zagreb and took out the silk-printing boards, we were suddenly full of ideas and excited to start experimenting. Thanks to Marco's creativity and Michele's aesthetic eye we printed 30 T-shirts which we were actually proud of and went to our first market in Bologna. There we sold all of our products and from then on we haven't stopped creating! ...The last first step: labelling the "Serie Zero"!